From that fateful day forward, the United States has been a nation ruled by fear. Government agents haul people out of their homes and into jail, searching for more of these superpowered people - these deltas - and force them to either join the government forces or rot in jail. The American dream is dead. Welcome to the American nightmare. The thing people are most scared of is you. 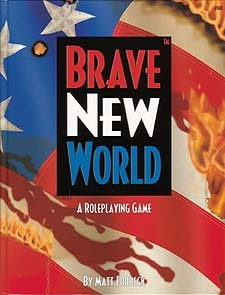 Brave New World is a brand-new roleplaying game suitable for experts and novices alike. In the game, you play a delta, a person with amazing powers and a reason to use them. The Brave New World rulebook comes complete with everything you need to know about the game in order to play, right between these two covers. So what are you waiting for? There's a brave new world out there, and it's up to you to save it!